She is known to those around her as the Willy Wonka of the cupcake world, pairing unexpected and unusual flavours together to create what she calls a “whimsical cupcake”. She spends hours mixing and matching different flavours together and pushing the boundaries of the human palette in order to create unique cupcakes such as Chocolate Milkshake and Fries, Basil Lemonade, Pandan Kaya and Cheddar Cheese and even a Salted Chocolate Coffee Cupcake. She is Ms Nursyazanna Syaira Mohammad Suhimi, 26, one half of Fluff Bakery, the bakery that has become synonymous with whimsical flavours and cupcakes that are filled with a ‘surprise’. She runs the bakery with her husband, Mr Ashraf Alami, 32. Unlike many bakers who like to stick to traditional flavours, Ms Nursyazanna Syaira is interested in pushing the traditional taste envelop and showing Singaporeans that “different flavours that you don’t think would go together can actually work well together”. “I wanted to expand the flavour horizon and create awareness in the Malay-Muslim community about the different types of flavours that are out there. The Malay-Muslim community has been brought up with a fixed mindset about things like flavours and I wanted to change that mindset,” she said. According to Ms Nursyazanna Syaira, her inspiration for flavours comes from everywhere. For instance, the idea for a Mango Sticky Rice cupcake came after she had tried the sweet and savoury dessert for herself and thought that it would be a interesting to turn it into a cupcake. Though creating such unique concoctions has been a risk, Ms Nursyazanna Syaira has pleasantly discovered that Singaporeans are a sporting bunch. “People take quite well to the flavours and they tend to be quite adventurous,” she said. “When I created the Green Apple Yakult and Lemon, people enjoyed it,” she added. Flavours such as the Green Apple Yakult and Lemon will be available together with 85 other flavours at their newly-opened brick and mortar store at 12 Jalan Pisang. However, not all flavours will be available everyday. There will be six different flavours on offer daily to allow patrons to try all of their different flavours but flavours such as their Red Velvet Nutella and Salted Caramel cupcakes are permanent fixtures on their menu. In order to find out what flavours are available at their store each day, interested patrons can visit their Instagram page. 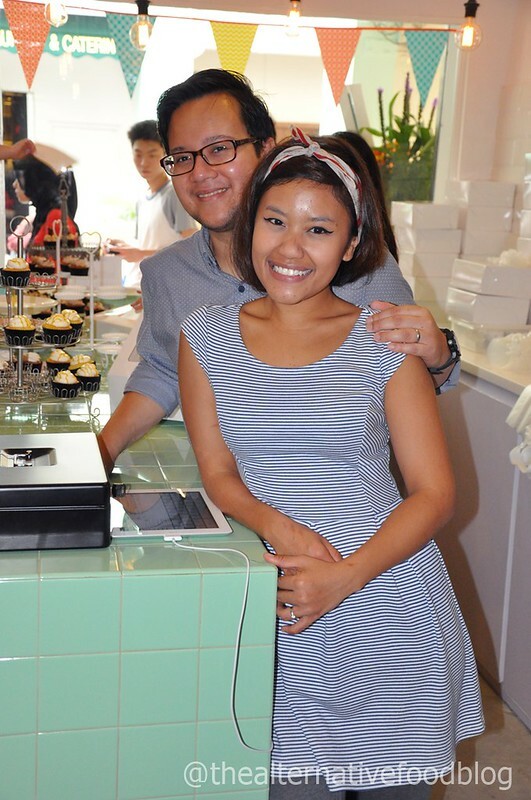 The cupcakes, which cost $4.00 a pop, may lean towards the pricey side but Ms Nursyazanna Syaira says that this is because each cupcake is hand-cored and manually filled with a specially created filling. According to Ms Nursyazanna Syaira, Fluff Bakery will produce about 800 – 1000 cupcakes at their new store daily and this number will gradually drop to 500 daily in order to make way for the creation of other baked goods such as big cakes like their signature vertical layered cake, tarts and macarons. Prior to the opening of their store, Fluff Bakery supplied their cupcakes to Penny University and Parlour by Ashley Isham. They will still continue to do so, but only in a few weeks time, after they have settled into a routine at their store. So, what can someone who has never tried a Fluff Bakery cupcake expect? “You can expect a variety of whimsical flavours that go together so well, cupcakes that are not that sweet and that are influenced by Asian flavours and basically, you will get something that you have never expected,” says Ms Nursyazanna Syaira. Head here to check out our feature on their opening day.